(TibetanReview.net, Dec05, 2015) – China has jailed two Tibetan Buddhist monks, aged 18-19, to Jail terms of up to four years in Ngaba (Chinese: aba) County of Sichuan Province in separate trials for having carried out lone street protests in support of Tibet’s exiled spiritual leader, the Dalai Lama. Both the monks belong to the county’s Kirti Monastery. Gendun Phuntsok, 18, has been jailed for four years, although the date of his trial and other details are not available, according to the Dharamsala-based Kirti Monastery monk Kanyag Tsering who closely monitors the situation in his homeland. He was tried by a court in Li (Tibetan: Tashiling) County, Ngaba Prefecture. He is presently said to be held in Mianyang Prison near the provincial capital Chengdu, a facility for holding political prisoners in the province. Gendun Phuntsok had staged a lone protest march in Ngaba county-town on Mar 8 this year, carrying a large portrait of the Dalai Lama garlanded with a yellow ceremonial scarf. He had shouted for the Dalai Lama’s return from exile and for ‘Equality and freedom for Tibetans’. He was born in Cha village of Ngaba County, with his parents being named as Tagya and Riggo. 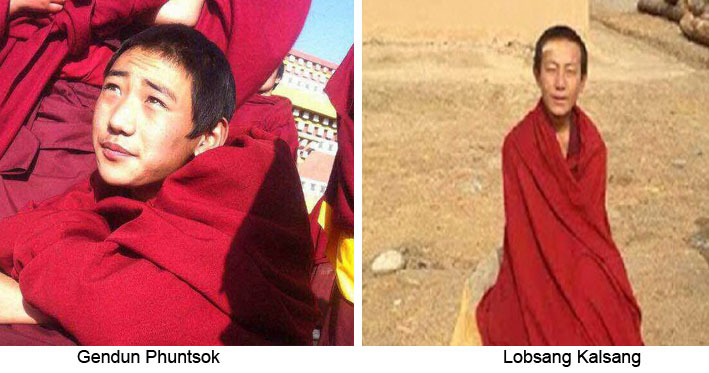 In another trial, held on Nov 2, Kirti monk Lobsang Kalsang, 19, was jailed for three and half years. He too belonged to Cha village of Ngaba County. He is said to be the middle of three children of Tsering and his wife Dechen.